Was there ever a time where being strong was the only thing you could be? Your life is turned upside down and you either grow up and be strong..or die. Most of us will never be in this situation. We won't have to wonder what happened to our parents or siblings, because we will be there to see them live their lives. This is exactly what happened to a young Jewish man during the holocaust. He was ripped from his mothers arms and forced to grow up to survive. This e book is the story of his life. It depicts everything leading up to the moment he was taken. His looks are something that helped him survive. Those piercing blue eyes got to everyone. This is such a powerful story. At times it made me smile, made me laugh, and other times it had me in tears. No one can understand what this man went through in his life besides other survivors. It's so amazing that he is so willing to tell his story. 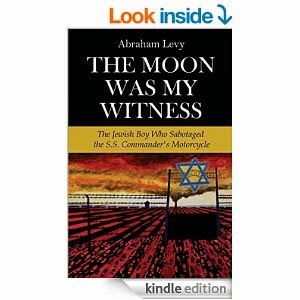 A story that will leave everyone with a little bit of a an understanding of the Holocaust and what happened to the people involved. No one can bring back the memories he lost or his childhood, but maybe he can find out some more about his family. Someone out there can shed some light and give him some answers! I really enjoyed this book. I didn't think I would because of the subject of it. But it is so well written, that I really got into this book! If you would like to check this book out, see what other people are saying about it, or buy an e copy for yourself, then head on over to the product page on Amazon, by clicking here. I received this product for free in exchange for an honest and unbiased review.